“Modernism” is such a loaded term when it comes to graphic design. For some, it’s the banal aesthetic that brought about the Helveticization of the corporate world and stripped the personality away from the non-stop barrage of advertising we are subjected to daily. To others, the term refers to something more political and innately humanist — a desire to live in a world where communications are enhanced, with the end goal of life being made more livable. Some view Modernism as a movement that had vaguely defined start- and end-points, while some view the contemporary age as being a mere moment in the continued evolution of a larger, socially focused Modernity. Here I take a bit of both “Modernisms” and speak of the Modern from a hybrid standpoint — an observation of the moments in time when we as a global society made a conscious effort to veer away from the fussy classicism and pre-industrial struggle of pre-Modernity and set to the task of trying to make graphic design for the people. Not that this was a purely altruistic pursuit: In Japan it tended to be trickle-down, with manufacturers and retail ventures being among the first to shift their visual methodologies1. This is complicated by the difficulty in identifying exactly what “Japanese Modern” graphic design looks like. A dizzying number of design idioms came into play both from domestic and international sources from the Meiji Era onward, so there is no overarching visual rubric which can be easily applied to define “Modern” Japanese graphic design. Critics such as James Fraser have argued that an application of visual elements co-opted from progressive aesthetics of foreign cultures, including but not limited to Art Deco and Avant Garde movements, defines Japanese Modern graphic design. 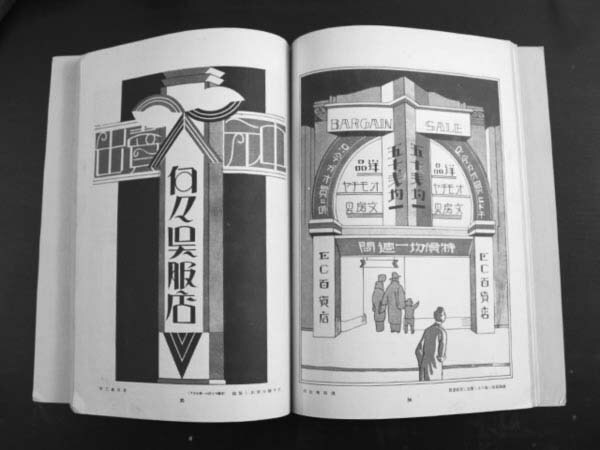 While there is no argument that forms of visual expression from abroad were highly influential (It is no coincidence that Marinetti’s 1909 Futurist Manifesto was translated into Japanese the same year it was published), little allowance is made for the myriad of other influencing factors — particularly the assimilation of vernacular advertising from both the West and the East. It was not just the Avant Garde that influenced Japanese design. Moreover, Japanese Modernity was just as much a self-initiated endeavor, not mere contextualization of foreign influence. To charge that the Modern shift was a mere synthesis of foreign visual elements is a simplistic misconception that has dogged the perception of Japan internationally for centuries. To pigeonhole “Japanese Modern” as merely design in Japan that aped the visual styles of avant garde movements abroad is both a disservice and a misstatement2. The Modern age in Japan started well before overt Western elements began appearing in posters, matchbox covers, book covers and signage country-wide in the 1920s. During the two decades prior a movement was already well under way towards posters and printed materials featuring reductive compositions with pointed, streamlined deployment of imagery and typography/lettering. Japan had a fully-formed culture of printing prior to the 1860 arrival of the first lithographic press from overseas and the founding of Japan’s first lithographic printing company in 1872. “Japan’s Gutenberg” Motoki Shōzō developed Japan’s first sustainable system of moveable type technology for printing (and Japan’s first typography school) in 1869, with the assistance of Irish American missionary William Gamble. Shōzō went on to form the Shinmachi Kappan Seizosho in Nagasaki, and his student Hirano Tomiji the Tsukiji Type Foundry in Tokyo, Japan’s first true type foundries. Both were innovators in creating multiple sets of type and introducing movable Latin types into the Japanese printing industry. 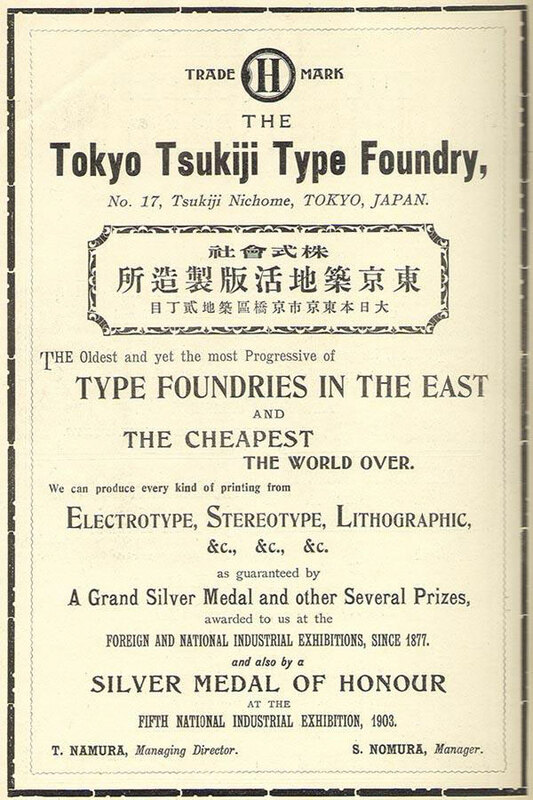 The Tsukiji Type Foundry provided lithographic and typographic printing services as well as layout services, printing a number of books in both English and Japanese that looked at Japan as subject3 prior to 1903. Integrated printing, design, and typographic services proliferated around the turn of the century, most notably in the formation of Shueisha (later the Dai Nippon Printing Company) in 1876 and the Toppan Printing Company in 1900. Both of these companies still dominate the contemporary printing industry in Japan. These companies’ initial rise, along with the peak of the Tsukiji Type Foundry’s influence in the beginning of the 20th Century, helped create and form public conceptions of graphic design as a pro-social activity that holistically engaged all aspects of commerce. Design departments at the Mitsukoshi and Takashimaya department stores opened in 1909 and 1912, respectively, each providing promotional advertising with streamlined visual messaging that showed an economy of form and directness in consumer appeal that can only be described as “modern” — free from visual frippery, excess ornament of earlier times and direct, to-the-point advertising copy. 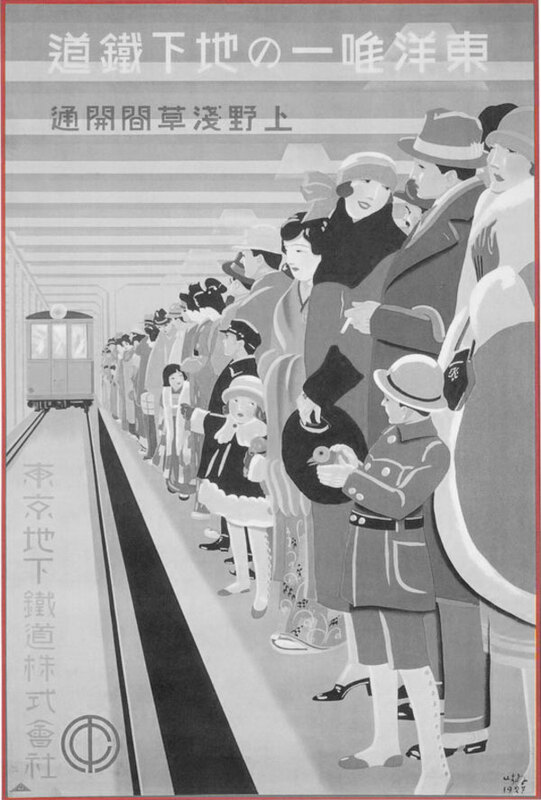 Sugiura Hisui, "The Only Subway in the East". Color lithograph, 1927. Ironically, it was this incorporation of design departments that would lead to the rise of Japan’s first “design stars,” most notably Sugiura Hisui, chief designer for Mitsukoshi and a member of the editorial committee of Gendai Shōgyō Bijutsu Zenshū (The Complete Commercial Artist). This was Japan’s most important graphic design publication at that time, providing commercial art and design in all its forms from both Japan and the world. Individual volumes focused on one or more disciplines, including poster design, advertising, package design, shop signs, billboards, flyers and broadsides, page layout and design, and typography, as well as other related subjects. Each edition was replete with substantial explanatory texts, profusely illustrated, and had many color plates reproduced within. Hisui would later go on to form the Shichinin-sha, an independent design research group that focused on applied typography, the effect of color, and the economy of visual style, as well as producing an annual poster exhibition. Japan’s second notable graphic designer Yamana Ayao established himself at a young age, designing and illustrating covers for magazines like Josei (Woman) and Kuraku (Joys and Sorrows) for the publisher Platon, as well as earlier designs for his self-initiated journal Chocolate while attending university. Ayao departed Platon to join the cosmetic company Shiseido’s design department at the end of 1928. At Shiseido, Ayao defined the company’s early house style — a tendriled, Aubrey Beardsley-influenced illustration-driven series of advertisements and publications that focused on slightly abstracted female forms, delicate gothic lettering, geometric elements, and arabesque calligraphic flourishes. In two scant years, Ayao became Japan’s first full-fledged graphic superstar, jettisoning his employment at Shiseido (though returning sporadically throughout his career) to take up the gauntlet at assorted design departments throughout Tokyo. The decade prior to Ayao’s initial time at Shiseido brought an onslaught of assimilation of distinctively foreign elements into Japanese graphic design4. Mirroring the European avant garde’s search for a streamlined purity of visual expression, the form of kanji and kana would be subjected to both hyper-decorative and ultra-reductive tendencies at the hands of designers.5 Foreign-designed avant garde art and design books were easily available from the early 1920s through 1938, most notably in Tokyo from Kaiser, a German bookstore in Kanda and the nearby book retailer Sanseido. Each stocked the renowned German design periodical Gebrauschgrafik alongside a wide array of exhibition catalogs and photography annuals from around the world. Soviet art and design publications were available from Nauka, a bookshop in Jimbocho that still exists today. 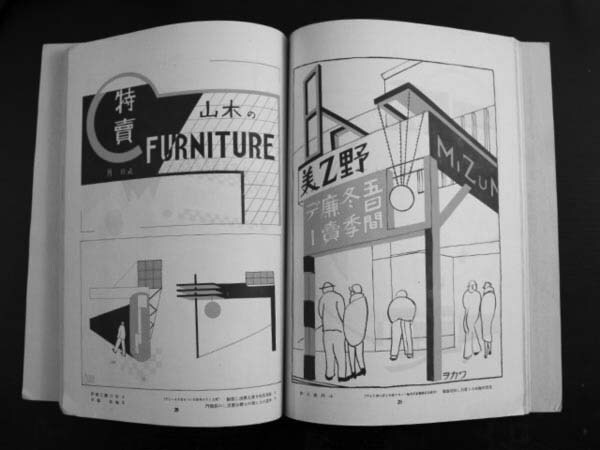 Foreign and domestic application of design trends and theories were catalogued domestically in periodicals like Gendai Shōgyō Bijutsu Zenshū and the intensely Modern-focused Kōkoku-kai (Publicity World). The latter was a diverse commercial art journal that mixed dynamic multi-color illustrations of lettering, page layouts, signage, and proposed kiosk designs with halftones imagery of graphic design, interior design, and architecture from abroad. A pronounced influence from the Russian and German left is evident in all three of these publications, as well as lesser journals such as Belarto, a short-lived art and design journal whose operations began and ceased within the span of one year — 1933. Just a few years later, these modes of graphic design were actively discouraged, leading to the imprisonment of a handful of leftist graphic designers who refused to convert to the state-approved style — a less architectonic, yet still Avant Garde-influenced amalgam of traditional and progressive design styles.6 Photo montage still had its place, but the notions which informed leftist designers and (some of) the style’s early deployment in Japan were displaced with the hardening national ideology of Japanese Imperialism. With the nations’ ideological and political teeth pulled immediately after the war, the citizens of Japan set to rebuilding the nation’s economy. This story includes Kihachiro Onitsuka, the founder of Onitsuka Co., Ltd. and the graphic designers, typographers, and printers who would help shape global perception of his brand. From its formation in 1949, the story of Onitsuka Tiger is one that is based on innovation in the development of footwear, starting in the years immediately following World War II. 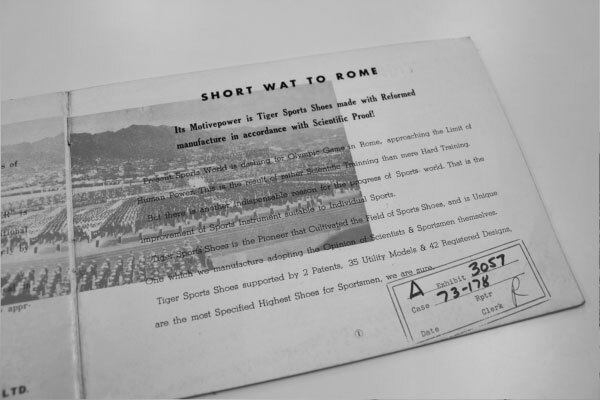 The company’s printed promotional materials consistently kept abreast of larger trends in typography, both technologically and aesthetically — the two innately tied together. 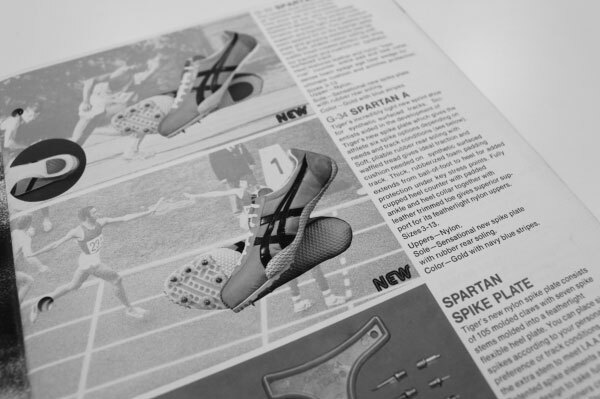 What drove the look of Onitsuka Tiger up to the 1980s was what was possible with printing technology, alongside then-contemporary typographic development and aesthetic taste. The 1950s were a time of monumental change in graphic design in Japan. It was the defining decade in elevating both the social and economic status of the designer in Japanese society. The Graphic ’55 exhibition helped the public associate iconic advertising imagery with individuals, enhancing their social recognition and allowing the designers involved to incrementally increase design fees. The exhibition included a range of design project formats, whereas earlier domestic graphic design exhibitions tended to focus on a sole format — the poster — and showed the public the range of works that designers could tackle. 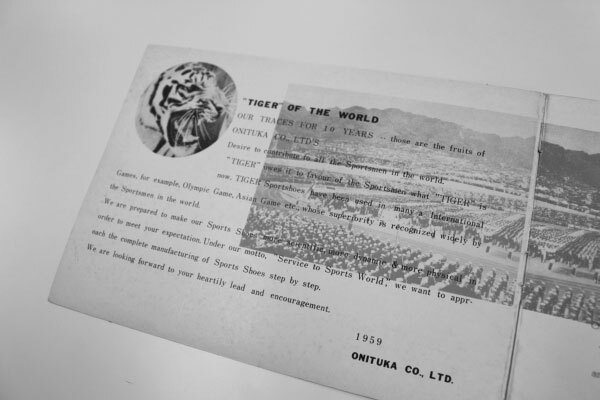 232 kilometers south in Kobe that same year, Onitsuka Tiger launched their own piece of highly memorable graphic design — a lavish product catalog that equalled the quality of the designers involved in Graphic ’55. Featuring a four-spot color cover printed by lithograph depicting reliefs of ancient Olympian athletes accompanied by geometric Latin and Japanese hand-lettering, the catalog evinced a sense of athleticism and commitment that resonates five and a half decades later. This catalog sets the tone for Onitsuka Tiger’s early graphic house style — visual interpretations of authenticity and sportsmanship rendered with a high degree of craft and artfulness. The company’s early catalogs were a melange of pre- and post-war influence, featuring a painterly style of illustration for their covers, with text hand-lettered or printed via letterpress. A number of the covers use the hazy gradated style that was popularized prior to the war by Takashi Kono for Nippon Magazine (prior to his conversion to a more simplified means of representation). Thin-line lettering that mirrored Hamana Ayao’s art nouveau and “moderne” takes on lettering adorned many of the covers alongside geometric Latin and Japanese lettering, tasteful mincho hand lettering, and Raymond Loewy-esque “streamlined” lettering which was just coming out of vogue in the United States. 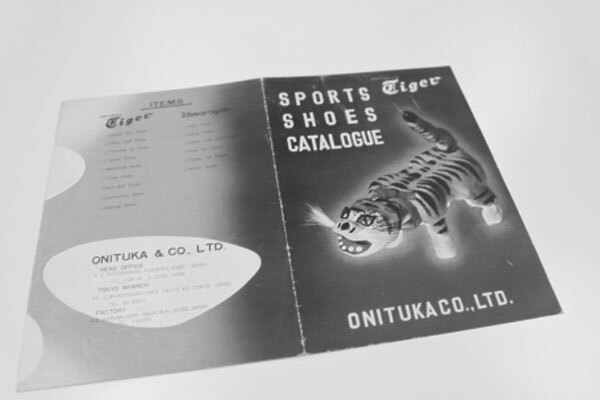 Onitsuka Tiger’s 1959 Spring Catalog is of note for the juggling of similarly-weighted but ultimately mismatched typefaces that betrays the lack of metal type that their printer/typographer had on hand, printed in black over expressive verdant green crops of halftoned images of sportsmen. The catalog’s interior deploys an odd mix of faces — one spread juxtaposes the combination of Franklin Gothic for the headlines, Bernhard Gothic Medium for the subheads and Century Schoolbook for the text on the left side and Futura Black for the headlines, Cheltenham Bold for the subheads, and Stymie Light for the text with reproductions of a hastily written “Tiger” in the mix sporadically. This array of typefaces is in large part a history of Modern type history in Europe and the Americas, and more surprisingly, the nexus of labor by three men who defined the development of graphic Modernity through their work. The 1960s saw a giant shift toward more free-form layouts globally, with dry transfer rubdown lettering freeing designers from having their layouts translated into metal grid layouts by typographers at printing companies, instead opting to paste up layouts and have them reproduced photographically. 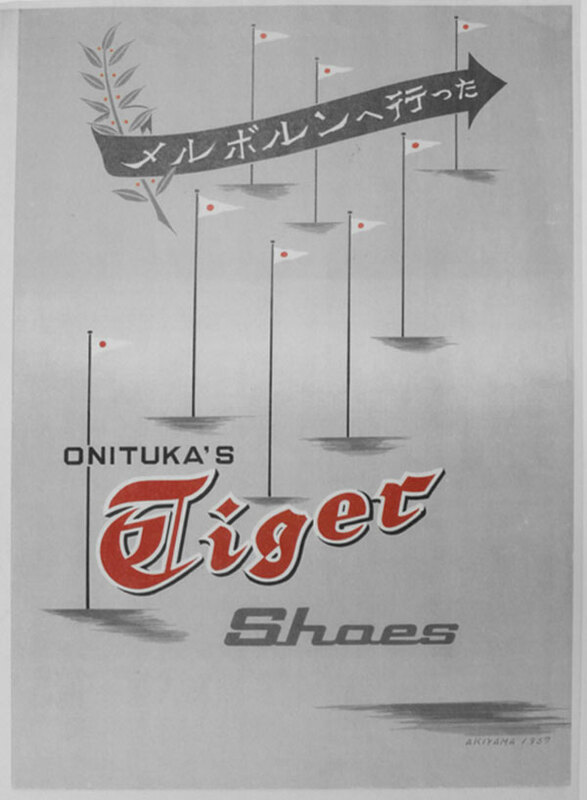 1963’s Onitsuka Tiger golf catalog brought a switch to rubdown Letraset lettering for headlines, indicated by wavering baselines and slightly skewed letterforms, set metal type in English and Japanese for body text, and purely photographic reproduction of complete layouts. The subsequent 1963 full product line catalogs also deployed Letraset for headlines with an ATF typewriter-style typeface with halftones images on the interior. The full catalogs’ covers featured awkward hand-lettering that mimicked the forms of Helvetica Medium. Each catalog was reproduced using black and one spot color, offered in a handsome collection of four stylistically unified brochure-style pamphlets of uniform size and layout. 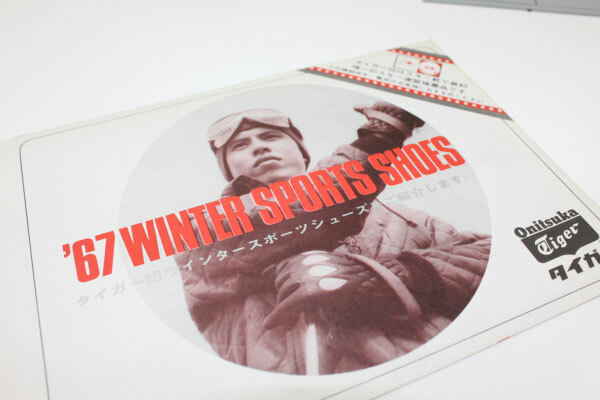 1964’s catalogs continued in much the same vein on the interiors, and opted for a calligraphic titling treatment for the Winter Sports Shoes Catalog. One notable shift was a switch to using gothic typefaces for Japanese for almost all catalog interiors, reserving mincho deployment for their golf promotions where the company felt a more traditional look would serve consumers’ opinions about the company. 1967 brought the first use of the typeface Compacta which would be a continued, though sporadic, visual identifier for the brand’s printed matter through the late 1960s. Compacta was designed by Letraset’s Fred Lambert, adapted from an anonymous German student alphabet made from cut paper that appeared in the 1952 book Hoffmans Schriftatlas by Alfred Finsterer11. With its inherent vertical thrust and machined appearance, Compacta was a logical choice for the company — it looked both serious and fun. 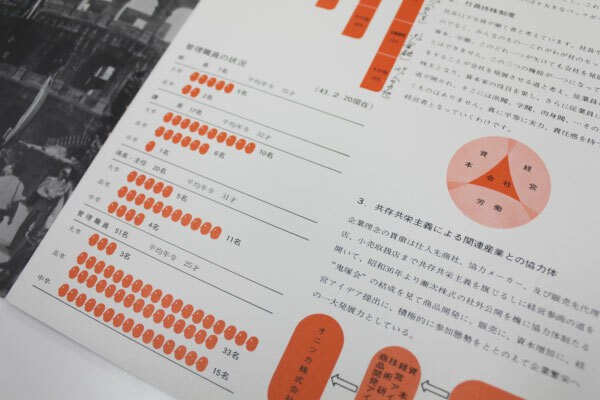 Onitsuka Tiger’s 1969 catalog saw use of two-color information graphics very much in the style of Austrians Otto & Marie Neurath’s Isotype12 stylized graphic devices used to help illustrate social statistics and signage in pictorial form. This foray was Onitsuka Tiger’s first investigation into information graphics in a meaningful, thorough way for their printed matter. 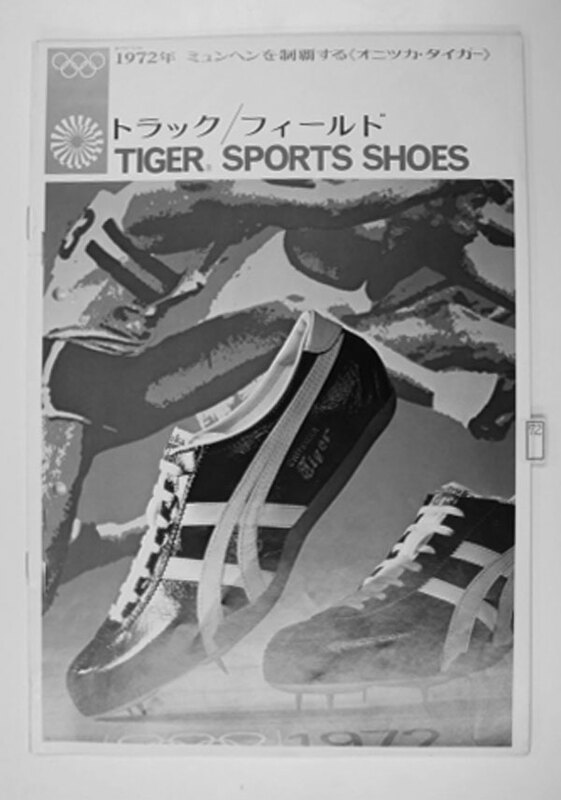 Olympians who used the company’s shoes, production statistics, market segmentation and market growth were all depicted in bold red and black in a manner that harked back to Isotype, as much as the rounded corners of then-contemporary style in the Onitsuka Tiger family tree of Olympians on the back inside cover of the catalog. It was a bold move, backing up what had previously been the mere atmosphere of the Olympic spirit with numbers interpreted both graphically and with acumen. In this way, the company’s 1972 summer catalog is related — products were photographed in full-color against poster backdrops designed by German Otl Aicher for the Munich Summer Olympics, Aicher being a champion and master of information graphics and of stylized pictographs.13 By adopting the 1972 Summer Olympics as the visual language of the company, for the first time a purity of the visual language of Modernism as a unified, totalizing force was applied directly to Onitsuka Tiger’s printed promotions. Aicher’s designs for the Olympics were a heady mixture of considered color14, refined form given shape through Aicher and his team’s solarized spot-color promotional poster imagery; economic creation and use of information graphics (most notably through devising a unified system of pictograms which resonate strongly today); and confident inspirational abstract geometric compositions and nuanced typography (Helvetica seeing one its brightest days in the sun in the Olympic identity program). By merely using Aicher’s posters, using a Helvetica clone and a stylized bifurcate kana headline display typeface to capture the spontaneity of Aicher’s designs, Onitsuka Tiger connected their brand identity to one of the strongest identity design projects in history, positioning the brand as a confident and connected internationally to exuberant, intelligent graphic design. Aicher’s body or work and writing stands as a milestone in graphic design history, emphasizing finished form-making, a dedication to communication, and a commitment to “thinking while making,” formal results being based on synthesis and an iterative process in lieu of easy “visual solutions” planned from start-to-finish with a minimum of “roadside” consideration. The five years that followed (and preceded Onitsuka Tiger’s dormancy as a standalone brand) would be dominated by technological innovations in their footwear and a slickness in graphic representation applied to both products and promotions alike. 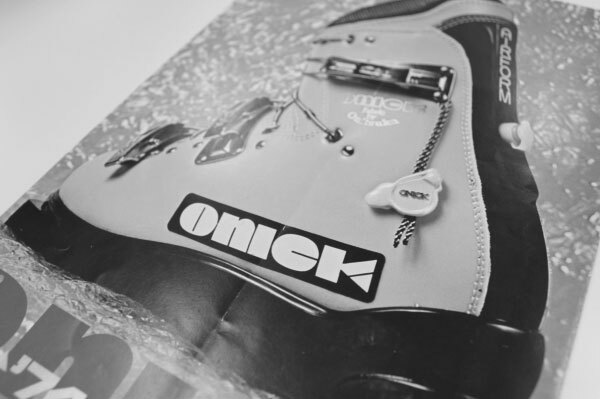 The pinnacle of the company’s efforts would occur in 1973 with a brochure for the ONICK ski boots, a revolutionary product that included a lemon-shaped hand pump called “The Air Lemon” that would pump air into a bladder which helped heel and ankle support. Emblazoned on the sides of the boots and on the brochure cover was a piece of swollen extended display lettering with razor-thin counters that mirrors the best original alphabets offered by Photo-Lettering, Inc. — the then-king of custom lettering who dominated the stylistic era of 1970s graphic design alongside the output of Herb Lubalin and his associates at assorted design and lettering ventures. The ONICK mark’s confident originality was accompanied by a host of similarly designed photolettering branding for Onitsuka Tiger projects like AFTER BOOTS, a line of exceptionally furry post-ski session luxury boots with vibrantly-colored stitching and an aerodynamic hand-lettered logo that combined rugged slab serifs with truncated swash elements and a photo-lettering outline treatment graphically. 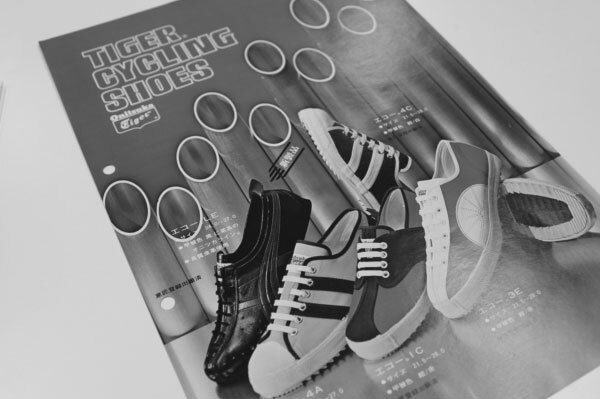 The 1974-1975 catalogs of Onitsuka Tiger’s products would be in step with the Heveticization of the rest of the corporate world that had been in progress for nearly two decades prior. This move was emphasized globally by design firms such as Chermayeff & Geismar and Massimo Vignelli’s Unimark and their assorted total branding programs for companies like American Airlines, Knoll, and 3M. Developed in 1957 by Swiss foundrymen Max Miedinger and Edouard Hoffma and further developed by a number of type foundries and type designers, Helvetica (née Neue Haas Grotesk) would become the graphic lingua franca of the corporate world. Due to its clean, neutral nature, Helvetica was believed to be both timeless in nature and neutral in tone, offering typographic information in a sober, practical manner15. These two years of catalogs utilize Helvetica arranged on a thorough, considered typographic grid with considerable white space surrounding the type and typographic pages offset with full-bleed photographs on opposing pages in spreads. They are both the most masterful of the company’s printed matter dating to that time and also the most toned-down — the overtly professional appearance overriding the spontaneity and idiosyncrasy that had been a hallmark of Onitsuka Tiger’s identity since day one. 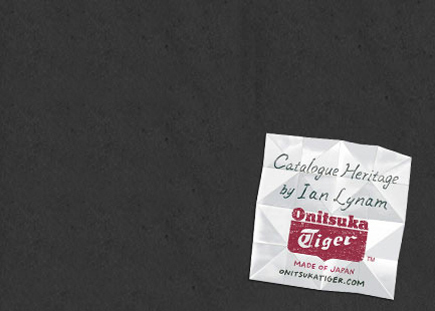 Of note are two particular Onitsuka Tiger initiatives that dodged the Helvetica bullet: the 1976 EMPEROR golf products catalog and the entire range of catalogs for Onitsuka Tiger in 1977. Both were inspirational in their use of color and bespoke lettering. 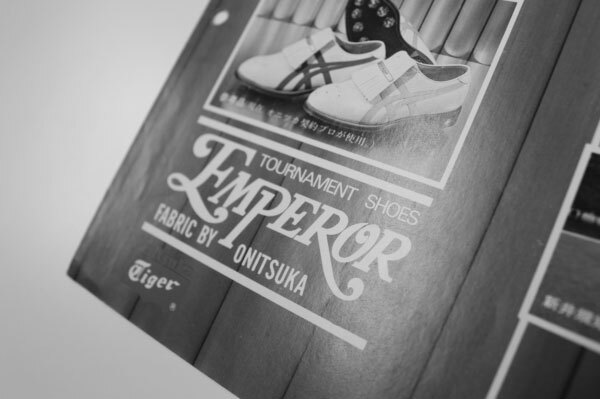 The logo for EMPEROR, Onitsuka Tiger’s line of golf footwear and accessories that was issued from the 1960s through the early 1970s (originally with the name of GOOD SHOT) is a unique bit of hand-lettering that fuses the sensibilities of Ed Benguiat’s interpretation of a Caslon for International Typeface Corporation (while simultaneously predating it) with the swashy features of a cancellaresca bastarda, then adding an extreme italic slope and a very ambitious “MP” ligature. Viewed through the contemporary lens, it’s a horsey piece of lettering that lacks finesse, but one cannot deny that it is interesting and adventurous. Within the EMPEROR catalog, products are shot against a backdrop of steel tubing, and this same backdrop is utilized again in all of the company’s 1977 catalogs for the photography, though paired with the typeface Neil Bold, an incised extra black display sans serif and favorite of later Blue Note Records releases and science fiction novels. Throughout the first era of Onitsuka Tiger, the brand showed a continued commitment to the classical nature of sport, as well as keeping the company aesthetically contemporary. The evolution of the company’s aesthetics mirrored the ambition of the people who were behind the development of the most progressive sports shoes in the first half of the Twentieth Century. 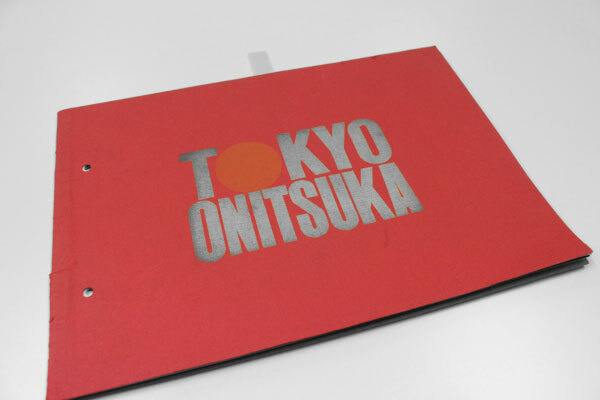 Onitsuka Tiger’s printed materials are a typographic goldmine and help tell the tale of their time, one of immense change. 1 The focus is even more myopic — I am looking at typography, a subset of graphic design, filtered through the lens of application by a sole company, Onitsuka Tiger, a Japanese company with an at times firm, at times tentative, foot in the North American and European markets, as well. 2 Something that has been actively taken up both abroad and domestically. 3 This self-awareness and self-analysis of nation is a key ingredient in what can be defined as Modernism: the recognition of nation precedes socially progressive trends of thought that affirm the power of human beings to create, improve and reshape their environment with the aid of practical experimentation, scientific knowledge or technology. 4 The Japanese graphic design work informed by foreign elements of the two decades prior to World War II is continually collected today, reprinted in cheap volumes by publishers like David and Seigensha. 5 The orthography of the Japanese visual language would be called into question time and time again, as well. 1919’s New Japanese Script, designed by Shokichi Toru, reduced the thousands of kanji and hundred-plus kana required to read Japanese down to a mere 125 syllabic glyphs, their form influenced by a mix of Latin, Cyrillic and Kana letterforms. 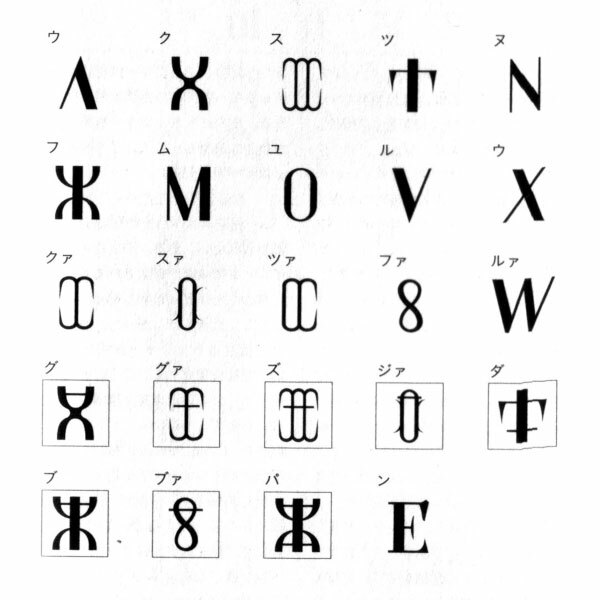 A more adventurous attempt was made by Itto Kojima in 1886, reducing the Japanese syllabary down to a scant base of 24 characters, 4 horizontal snap-on bars that denoted inflection, and an encapsulating box to create variants of each syllable. In total, the result was a compendium of 204 characters that represented 609 different sounds. Kojima and Toru’s revisionist syllabaries are discussed in brief in Zerro, a compendium of dead visual languages that was self-published by Yukimasa Matsuda and his excellent and adventurous Ushiwaka-maru publishing imprint. 6 Of note, conversion-wise, was Yamana Ayao’s shift from increasingly Western-looking illustrations of women to more traditional Japanese-looking subjects as depicted on the covers of the first two issues of the state-approved Nippon Magazine published in 1935 and Takashi Kono’s move from a Tschicholdian use of “typo-photo” to a more subdued style of photomontage that had distinctly Japanese elements at its core for Nippon Magazine. 8 Loewy’s additional projects for Asahi Beer, Mitsuwa Sekken Soft Soap and Fujiya and their associated massive fees entrenched Loewy as the most popular American designer in Japan during that decade. 9 The industry was imbued with the moniker “graphic design” and acknowledged as a term and specialized practice by American William Addison Dwiggins in 1922. 10 This was fine for a while, but had all of the life wrung out of it by 1959 internationally. 11 In 2007, I revisited the original student alphabet and released it as Vorganger Grotesk — an authentic representation of the originator’s graphic intention, as represented in the aforementioned. It is the headline typeface of Néojaponisme. 12 More here on the Neurath’s Isotype project. 13 As well as being someone run down by a car outside of his home in 1991 while crossing the street on his riding lawnmower. 14 This color palette has been referenced a number of times post-1972, perhaps most notably in Los Angeles motion graphics production company Brand New School’s redesign for the television network, The International Music Feed. A critique of that here. 15 There is little need to expound further on Helvetica here — the amount of research regarding this single typeface family is staggering. For an entertaining introduction that helps impart a sense of the development of graphic design as a visual and social culture from pre-Modern to PostModern times, I highly recommend viewing Gary Hustwit’s 2007 documentary film Helvetica. It seems worth mentioning that in the immediate post-War, there was a serious spelling reform and a moderate amount of simplification of the kanji. That Tsukiji ad is delightful! I’ll take the opportunity to point to my favourite free Japanese typeface, Dejima Minchō, which is based on Tsukiji fonts.